The feared effect of West Ham hiring David Moyes is playing out for Chicharito, and it couldn't come at a worse time, with the World Cup on the horizon. West Ham’s impressive 4-1 victory against Huddersfield Town helped the East Londoners jump to 11th place in the Premier League and ease some relegation worries, with the Hammers now five points and six teams clear of the drop zone. Thanks in part to David Moyes–who reached his 200th win as a Premier League manager–the club is sailing on smoother waters. Javier “Chicharito” Hernandez, however, had to once again settle for a place on the bench as an unused substitute on Saturday. 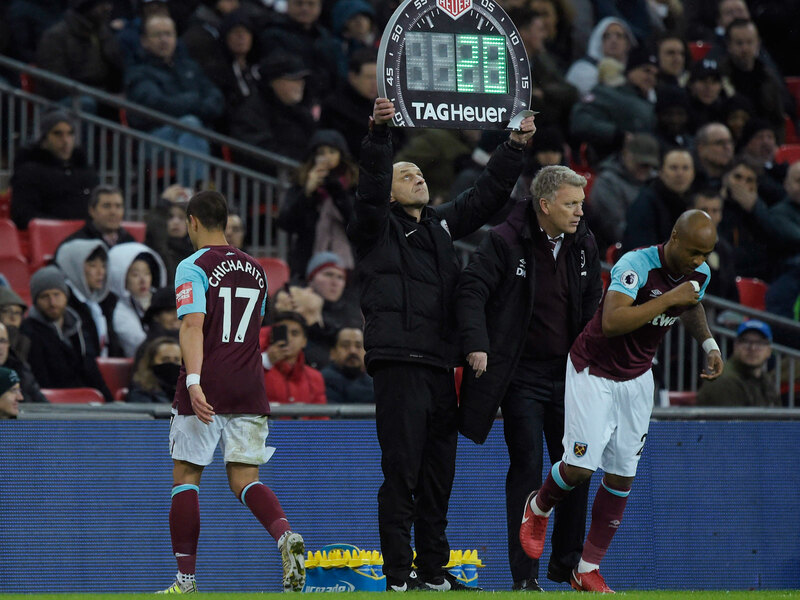 Even when Marko Arnautovic (who now has six goals in the league) came off in the 83rd minute, the Austrian was replaced by Andre Ayew, confirming that Chicharito is far down in Moyes’s pecking order. Since recuperating from a hamstring injury last month, Mexico’s all-time leading goal scorer has accumulated 140 minutes of action in all competitions. Despite the lack of playing time, Hernandez remains second in scoring for his club with four goals. Timing has played the role of a cruel mistress for Chicharito as the hamstring injury came during international duty and coincided with Moyes’s arrival – a similar scenario to when both met for the first time at Manchester United. By the time Chicharito healed, Moyes already had an immediate idea of what he wanted–a physical, imposing front line where the midfield pushes high up. The lone poacher, therefore, is not needed as the aim is to use players such as Arnautovic and Michail Antonio to do much of the legwork while Manuel Lanzini and Mark Noble provide the creativity. It doesn't leave much room for Chicharito to make his mark. Moyes, however, still believes the Mexican is part of his plans. But no matter what the manager states, the reality is simple: Moyes and Chicharito don't make a good match, because the coach's methods do not fit the striker's strengths, and in a scenario where his biggest priority is league safety as opposed to having the flexibility to experiment, not much is likely to change. In Moyes's defense, he has to look after the well-being of the club and not any single player, so if the tactics are working, why should his choices change? West Ham is unbeaten in four (2-0-2) and has scored 10 goals in that time. That does little for Hernandez and his own momentum in a World Cup year, in which Mexico aims to go further than the round of 16 for the first time since 1986. Amid reports that West Ham would listen to offers for Chicharito, he must ask himself if it's worth staying at West Ham and fighting for his place or risk a moving to another club–or potentially a new league–for the sake of more playing time. No matter what happens, his spot–barring any injury setbacks–in El Tri’s World Cup squad is more than secure, as Juan Carlos Osorio sees Chicharito as Mexico’s main target man. Even if he stays at West Ham, regardless of playing time, it would be difficult to see this changing, as Osorio also prioritizes European competition above anything else. These should be comforting words to Chicharito and for bit role players who don’t have his reputation, such as Benfica’s Raul Jimenez or Roma’s Hector Moreno, but a player like Chicharito ultimately needs to start, because a poacher thrives on confidence, and confidence creates goals. MLS has made a play for Chicharito before, and if he's truly available, there's little reason to believe the league wouldn't kick the tires on trying to lure him again. If we were to play a hypothetical, an appealing destination could be a move to expansion club, LAFC, where he could form a partnership with countryman Carlos Vela. According to reports, Bob Bradley’s team is interested in the move, and on paper it seems like a good fit, especially in a California environment that celebrates Mexican talent. But the new season doesn’t kick off until March 3, three months before Russia, and Hernandez can’t really afford to trade the next six weeks of potential playing time for an MLS preseason. Another possible outcome could be a return to Mexico and Liga MX. The 2018 Clausura season is already underway, and Mexican clubs have until the end of the month to register foreign players. Perhaps Chivas, the club that launched his career, has a chance to come in for a storybook reunion? Or what about Club America, which has already signed Jeremy Menez but is still on the hunt for another striker? A less drastic option is that Hernandez moves to another club in the Premier League, and perhaps a loan move and a storybook return to Manchester United is the right antidote. The red side of Manchester has always appreciated Chicharito and the attributes he offered as an explosive substitute. Given Romelu Lukaku’s recent inconsistency, Zlatan Ibrahimovic’s continued comeback from injury and Jose Mourinho's affinity for Chicharito given their time together at Real Madrid, this move could prove to be a popular one for everyone involved–though it wouldn't solve the problem of getting Chicharito into a starting lineup on a regular basis. Whether he stays at West Ham or goes to another club, one thing is for certain: The 29-year-old Hernandez–ahead of what could be his last World Cup–needs to find a way to get back on the pitch.